Harvard Research Team Reveals The SHOCKING ‘Superhuman’ Abilities Of The Tibetan Monks! 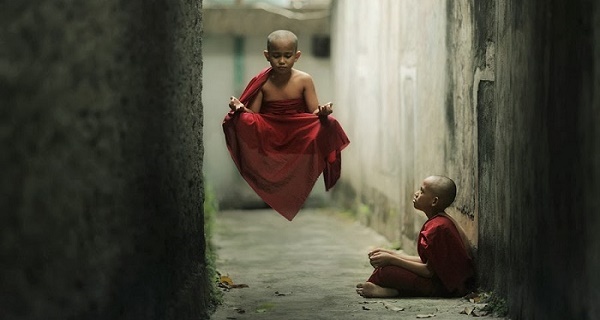 Home » Health » Harvard Research Team Reveals The SHOCKING ‘Superhuman’ Abilities Of The Tibetan Monks! It’s fascinating to consider just how many ancient teachings tell us that humans have the capacity to gain extraordinary powers through various techniques. Some of these techniques, known as siddhis in the yoga tradition (from the Sanskrit, meaning “perfection”), include meditation, static dancing, drumming, praying, fasting, psychedelics, and more. In Buddhism, for example, the existence of advanced powers is readily acknowledged; in fact, Buddha expected his disciples to be able to attain these abilities, but also to not become distracted by them. I had never before seen a man who could sit still without blinking his eyelids for eight to ten hours, but this adept was very unusual. He levitated two and a half feet during his meditations. We measured this with a string, which was later measured by a foot rule. I would like to make it clear, though, as I have already told you, that I don’t consider levitation to be a spiritual practice. It is an advanced practice of pranayama with application of bandeaus (locks). One who knows about the relationship between mass and weight understands that it is possible to levitate, but only after long practice. . . He (also) had the power to transform matter into different forms, like changing a rock into a sugar cube. One after another the next morning he did many such things. He told me to touch the sand – and the grains of sand turned into almonds and cashews. I had heard of this science before and knew its basic principles, but I had hardly believed such stories. I did not explore this field, but I am fully acquainted with the governing laws of science. A lot of these stories exist within the literature and lore, but they are just stories, up to the readers to decide if they hold any actually credibility. Of course, one who subscribes to various ancient teachings would be more inclined to believe that these are more than just stories and tales. With science shedding light on the possible truths of ancient mysticism, it’s not implausible to think that, at one time, these abilities were more common knowledge. Broadly speaking, although there are some differences, I think Buddhist philosophy and Quantum Mechanics can shake hands on their view of the world. We can see in these great examples the fruits of human thinking. Regardless of the admiration we feel for these great thinkers, we should not lose sight of the fact that they were human beings just as we are. A fundamental conclusion of the new physics also acknowledges that the observer creates the reality. As observers, we are personally involved with the creation of our own reality. Physicists are being forced to admit that the universe is a “mental” construction. Pioneering physicist Sir James Jeans wrote: “The stream of knowledge is heading toward a non-mechanical reality; the universe begins to look more like a great thought than like a great machine. Mind no longer appears to be an accidental intruder into the realm of matter, we ought rather hail it as the creator and governor of the realm of matter. Get over it, and accept the inarguable conclusion. The universe is immaterial-mental and spiritual. For a selected list of downloadable peer-reviewed journal articles reporting studies of psychic phenomena, mostly published in the 21st century, you can click here. During a visit to remote monasteries in the 1980s, Harvard Professor of Medicine Herbert Benson and his team of researchers studied monks living in the Himalayan Mountains who could, by g Tum-mo (a yoga technique), raise the temperatures of their fingers and toes by as much as 17 degrees. It is still unknown how the monks are able to generate such heat. And it doesn’t stop there — the researchers also studied advanced meditators in Sikkim, India, where they were astonished to find that these monks could lower their metabolism by 64 percent. In 1985, the Harvard research team made a video of monks drying cold, wet sheets with body heat alone. Monks spending winter nights 15,000 feet high in the Himalayas is also not uncommon. These are truly remarkable feats, and not the first time science has examined humans who can do extraordinary things. If you’re further interested in this subject, I recommend reading Supernormal: Science, Yoga, and the Evidence for Extraordinary Psychic Abilities by Dr. Dean Radin, Chief Scientist at the Institute of Noetic Sciences.